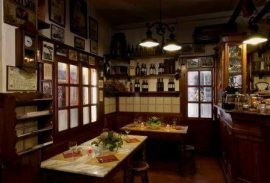 Osteria Antica Mescita San Niccolò was a hidden culinary gem of Florence. We didn’t have much of a particular expectation upon dining there, other than knowing there are really authentic restaurants on the other side of the Arno. Antica Mescita was very quaint and charming, the ambiance itself in the restaurant was very cozy and slightly antique, the wall was dotted with old wine bottles and paintings of Niccolo Machiavelli. It sat about 20 people on the first floor area inside, with more tables outside and down below that could seat an additional 25-30. The tables were sturdy marble tables and the interior was quite dark, but very cozy. The staff at the Osteria made sure we understood everything on the menu and checked to make sure we did not have any questions.We had heard that the Pappa al Pomodoro was highly recommended so some of us ordered it. It came out piping hot and although it was not very appealing since it’s clumps of soupy bread and tomato, its taste was something completely different. With elements of basil, olive oil, salt, and pepper, and the velvety tomatoes and spongy bread, this bread soup was gone within 2 minutes. It was light and packed full of flavors, but left room for the primo piatto. One of us got an arugula salad with pear, Brie, and pine nuts. The arugula was very fresh, and the cheese was very creamy and paired very well with the sweetness of the pears. The nuts were also a nice added crunch. Several of us ordered the gnocchi which came out of the kitchen very quick and was quite hot. The gnocchi was served in an herbed tomato ragu sauce that was thin but very savory. The gnocchi themselves were small and buttery, falling apart the moment we put them in our mouths. They were a potato gnocchi, and were quite filling, but we would all definitely go back for more. We also tried the Bistecca alla Fiorentina which was large cooked medium rare. This dish turned out to be quite an experience because our waiter came out and cut the meat right in front of us. He was laughing with us and let us take a photo of him. The dish itself was delicious, as it had a very nice char flavor on the spiced outside of the cut. The bite was salty and savory, and the meat cut quite easily. Two of us also ordered the bocconcini di pollo al limone or bocconcini lemon chicken. This dish, while very unappealing looking was delicious! It reminded me of a boiled chicken with a lemon gravy sauce. The chicken was very tender and easy to eat and the gravy on top made for a sort of comforting food taste like something one would find in their home during winter time. The lemon while seeming subtle was in fact not and just the right amount of flavor that it was not overwhelming.Very delicious meal that I would definitely recommend. Overall, we really enjoyed dining at Antica Mescita with its charm and quaintness, great quality and variety of dishes, and not to mention very accommodating and friendly staff, we would certainly go back there and recommend it to others. This entry was posted on Friday, December 7th, 2018 at 8:00 am. It is filed under Florentine Foodie. You can follow any responses to this entry through the RSS 2.0 feed.